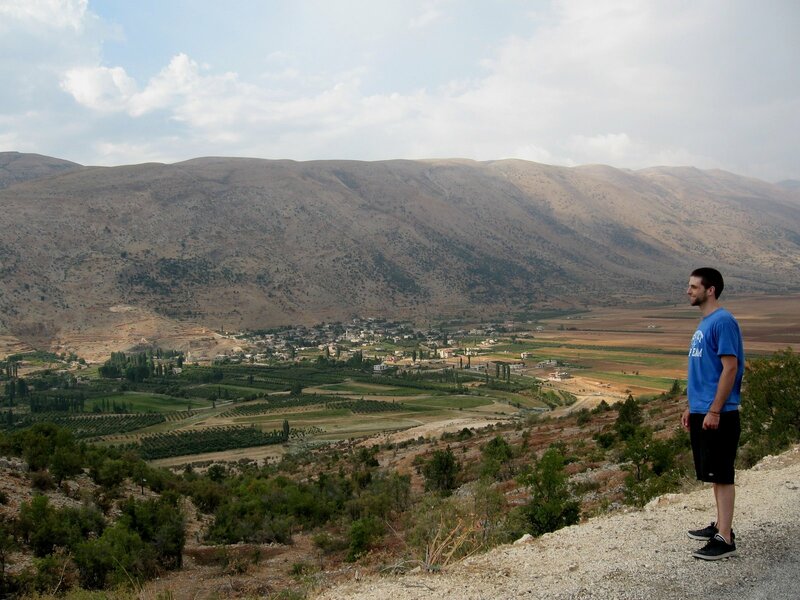 I got a call around noon on Sunday — my last Sunday in Lebanon — from my capoeira friends asking if I wanted to come to the Bekaa to do a workshop for a youth camp. Duh. Of course I want to go on a road trip with a bunch of capoeiristas to northern Lebanon! An hour later, I was cruising up the Damascus Road in the back seat of a capoeirista’s jeep with a berimbau lying across the middle of the car. We came to the crest of the mountains and beheld the mighty Bekaa Valley. It was supposedly the breadbasket of the Roman empire, full of grains and fruits for nearly the length of Lebanon. Now, it still produces some of the best fruits, vegetables and wines, but it has been left out of the international trade loop, people say. It is relatively impoverished and development has bypassed it. Parts of it are home turf for Hezbollah. On the far side of this deep, broad valley rise the slightly more arid ante-Lebanon ranges. On their far side — in their rain shadow — lies Damascus. The view has the same effect as the one that greets you coming over the Grapevine from Los Angeles into the Central Valley of California. You know, the view that Tom Joad sees in The Grapes of Wrath when his Okie convoy finally comes through the Mojave. Ahead of us was a thunderstorm: a good, old-fashioned, high-desert, afternoon-sky-blackening thunderstorm. My instructor — who lived in Albuquerque for years — and I immediately knew it was going to be a nice rain. We had a fun time arguing with the Beirutis in the car, whose conviction that rain does not fall in Lebanon in August under any circumstances was stronger than the evidence before them. Finally the blessed drops began to fall, and we stopped the car and greeted the moisture with out-stretched arms. Such refreshment is hard to come by down in Beirut. We turned up into the hills to the west, and began a slow ascent through mountains that looked exactly like the semi-arid country of southern Colorado. The difference was that here, the soil was limestone, and the trees were not pinions and junipers but olives and other deciduous trees. They grew in the same evenly spaced patterns of a pinion forest. A breeze was blowing and I could smell the rain. I felt right at home. In a small dale where the road was glistening from the recent rains, we stopped by a cabin where some apple trees were growing. A man in camouflage pants with a pony tail came out of the cabin. Some children and women were in the background. “Uh, no, we just wanted some apples,” I said in Arabic. It was a puzzling and light-hearted conversation. We had no interest in his more exotic goods, but we left with our delicious, fresh apples and drove above dark green fields of crops (you read correctly, Cypress Hill fans) to the camp where we were doing the workshop. The picture above was taken on the last leg of the trip, above the little valley where the hamlet is. At the summer camp, we did drills with everyone in the late aternoon on a large stage. People liked it — the children were most enthusiastic — but their attention was mixed until we played in a huge roda and they got to see the acrobatics and contortion of the game. Then, with great enthusiasm, everyone taught us same dabkeh steps and played darbakeh beats on the African drums we had brought along. We drank fresh cold water from a stream (hope that was OK, everyone was doing it) and ate a meal of fresh fish, fattoush and french fries. The full moon came up over the beautiful valley and the air was very cool (elevation about 1,500 meters). It felt just like a New Mexican village. We left despite the entreaties of several young men who begged us to stay and talked about American music with us. Most of the people in the camp were visitng from the middle of the Bekaa and thought of the locals as a bit backward. (Which was a little funny since that is how Beirutis probably view them.) The town looked like Hezbollah ran most major operations, despite the presence of a cursory Lebanese army post. We cruised back out over the hills in the moonlgiht and told each other scary stories. I freaked everyone out with La Llorona, which seemed appropriate to the landscape. Finally, we were back in the flats of the Bekaa, and drove by the awesome (not in the surfer sense — rather, the original sense of the word) Roman ruins of Baalbek. To make everything unbelievably perfect, we had the windows open bumpin’ Marvin Gaye as we drove past the towering columns and still-intact temples of the ancient city. So the denizens of the surrounding town got a nice taste of Sexual Healin’ before we left down. Which is really very appropriate for Lebanon, whether or not you are in a Hezbollah-dominated area. People like to live, and they are used to the outside world. Anyway, that’s the story of my last Sunday. I gotta say it was a good day. how disappointing. this doesn’t open/download.